Located on the islands of Zealand (Danish: Sjælland) and Amager in the Danish Straits, Copenhagen (Danish: København) is the capital and largest city of Denmark. Since 1999 (the bridge actually opened to the public in in 2000), Copenhagen has been connected to Malmö, Sweden by the Oresund Bridge (Danish: Øresundsbroen; Swedish Öresundsbron), which is a combined four-lane road and two-track rail bridge. It is a little hard to pin down the exact population of Copenhagen, because the city limits are not well-defined. However, if you total the population of the 33 municipalities close to, and including, the municipality of Copenhagen, as of 2007, the total was 1,825,814. On the other hand, if one only counts the population for the contiguous built-up area, the population figure only comes out to about 1.1 million. The Little Mermaid statue in Copenhagen harbor - This is small, but highly distinctive and famous statue which sits on a rock in the harbor. It was created by the Edward Eriksen, and is inspired by the fairy tale of The Little Mermaid, written by Danish author, Hans Christian Andersen. 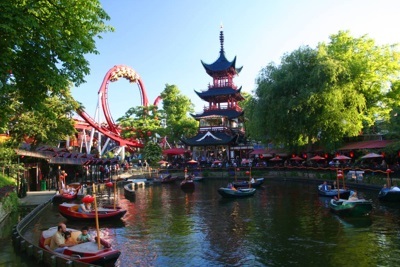 Tivoli Gardens - A famous amusement park, which is in fact one of the oldest in the world, dating back to 1843. On your visit to Copenhagen, we also recommend that you visit the Nyhavn area if you get a chance. This is a popular area with many bars and restaurants lining the streets bordering a picturesque harbor. It's a wonderful, if crowded, location to sit outside and enjoy at an al fresco meal or drink on a sunny day. On cooler days, it's easier to get a seat, and many restaurants will thoughtfully supply a blanket to cover your legs. Copenhagen (Danish: København) is the capital and largest city of Denmark. Copenhagen is located on the islands of Zealand (Danish: Sjælland) and Amager in the Danish Straits. As of 2007, the population of the entire municipality of Copenhagen was 1,825,814. However, the population for the contiguous built-up area, was only about 1.1 million. Copenhagen is not only the capital, economic and financial center of Denmark, but also one of the leading business centers for the entire Scandinavian-Baltic region. International companies headquartered in Copenhagen include A.P. Møller-Mærsk, Carlsberg, Novo Nordisk, and Novozymes. Copenhagen has some of the highest gross wages in the world. However, taxes are relatively high, and it has one of the highest costs of living for any city in Europe. Copenhagen is connected to Malmö, Sweden via a combined four-lane road and two-track rail bridge - the Oresund Bridge (Danish: Øresundsbroen; Swedish Öresundsbron). Copenhagen has an oceanic climate. The climate is also influenced by the Gulf Stream, which brings warm water across the Atlantic from the Gulf of Mexico, causing temperatures to be about 5°C higher than would otherwise be expected for a city at Copenhagen's latitude. Low-pressure systems from the Atlantic do however cause the weather to be unstable throughout the year. Generally speaking, precipitation is moderate throughout the year, with the heaviest rain occurring between July and September. From December to March, temperatures are usually around freezing point, and there is a chance of snow as well as rain. Lonely Planet Pocket Copenhagen is your passport to the most relevant, up-to-date advice on what to see and skip, and what hidden discoveries await you. Enjoy all the fun of the fair at Tivoli Gardens, relive history at the engrossing Nationalmuseet, or be inspired at Louisiana, one of Europe's great modern art museums; all with your trusted travel companion. Get to the heart of the best of Copenhagen and begin your journey now! Newly updated, revised, and redesigned for 2018. True to its name, DK Eyewitness Travel Guide: Top 10 Copenhagen covers all the city's major sights and attractions in easy-to-use "top 10" lists that help you plan the vacation that's right for you. This newly updated pocket travel guide to Copenhagen will lead you straight to the best attractions the city has to offer, whether you want to stroll around Nyhavn, visit Tivoli Gardens, tour Rosenborg Castle, or see the finest in Danish designs at must-see museums and galleries. Whether you're looking for the things not to miss at the Top 10 sights or want to find the best nightspots, this guide is the perfect pocket-size companion. Rely on dozens of Top 10 lists--from the Top 10 historic buildings to the Top 10 Hans Christian Andersen sights; there's even a list of the Top 10 things to avoid! The guide is divided by area, covering all of Copenhagen's highlights, and packed with reviews for restaurants and hotels. * Brand-new itineraries help you plan your trip. * Expanded and far more comprehensive, the new laminated pull-out map now includes color-coded design, public transportation maps, and street indexes to make it even easier to use. * Maps of walking routes show you the best ways to maximize your time. * New Top 10 lists feature off-the-beaten-path ideas, along with standbys like the top attractions, shopping, dining options, and more. * Additional maps marked with sights from the guidebook are shown on the inside cover flaps, with selected street index. * New typography and fresh layout throughout. You'll still find DK's famous full-color photography and museum floor plans, along with just the right amount of coverage of history and culture. A free pull-out map is marked with sights from the guidebook and includes a street index. The perfect pocket-size travel companion: DK Eyewitness Travel Guide: Top 10 Copenhagen. Copenhagen, sometimes referred to as a "fairytale place", is surely among the most delightful cities of Europe. The home of Hans Christian Anderson, and the location of the world-famous "Tivoli Gardens", which so inspired Walt Disney, it is one of the most heavily-visited destinations on the continent, attracting many millions of visitors each year. With this handy, pocket-sized, and thoroughly revised guidebook in hand, travelers will be able to organize their time in the smartest manner possible. - Sample one-, two and three-day itineraries and thematic itineraries for families, art and architecture lovers and those in search of “royal Copenhagen” or Hans Christian Anderson sights. - Tear-resistant foldout map in a handy, re-closable plastic wallet and bulleted maps throughout that lead the read through the city . To do all this, we have called upon the considerable talents of Chris Peacock, who lives in Copenhagen and has written extensively about all things Scandinavian. Chris has more than a decade of experience in travel journalism and is a former contributing editor for National Geographic Traveller and ABTA Magazine in the UK. In addition to being responsible for our Copenhagen Day by Day, he produces numerous articles and reviews of Scandinavian travel for leading newspapers, magazines and websites. Lonely Planet's Pocket Copenhagen is your passport to the most relevant, up-to-date advice on what to see and skip, and what hidden discoveries await you. Enjoy the whimsy of Tivoli Gardens, swoon at Danish design at the Designmuseum Danmark, see the dazzling crown jewels at Rosenberg Slot and shop to your heart's delight at Torvehallerne KBH; all with your trusted travel companion. Get to the heart of the best of Copenhagen and begin your journey now! The Perfect Choice: Lonely Planet's Pocket Copenhagen, a colourful, easy-to-use, and handy guide that literally fits in your pocket, provides on-the-go assistance for those seeking only the can't-miss experiences to maximise a quick trip experience. Looking for a comprehensive guide that recommends both popular and offbeat experiences, and extensively covers all of Copenhagen's neighbourhoods as well as all of Denmark? Check out Lonely Planet's Denmark guide. Authors: Written and researched by Lonely Planet and Cristian Bonetto. 25 Secrets you’d never find out about Copenhagen! Welcome to the most Complete Copenhagen Travel Guide for Tourists made by locals! If you are heading to the wonderful city of Copenhagen anytime soon this book will give you an insight of the best places and most unique places to see where you will mingle with the locals and get to see and do the activities as one of them. Most people don't even take the time to prepare themselves in advance, and just wish for the best once they have arrived! Most people aren't aware of some of the most amazing places Copenhagen can offer... And it'd be such a pity to miss them! That's precisely why we desperately need the RIGHT travel guide first. Don’t arrive to Copenhagen (Denmark) and follow the crowds of Tourists. With this exclusive travel guide made by locals you will be finding about the places that don’t come on Lonely Planet’s or are listed on Trip Advisor where thousands of tourists head daily. We will tell you where you should go, eat, sleep, and of course, party! We know you won't just settle for average boring travel guides! We know you are looking for something better; something unique that will truly help you down the road: a book with real life tips, recommendations, useful travel hacks and data... everything you may need in your trip. You've just found what you were looking for! Our goal is simple. we will give you a complete and detailed Bucket list with MAPS to all the locations to make sure you won’t get lost in the amazing city of Copenhagen transforming your trip into absolutely amazing experience. We will help you simplify your path, showing you exactly where the best places are. Brought to you by Viction: ary, CITIX60 is the locals guide to some of the worlds most renowned design hubs cities that lead the world in creative output. Curated by a select group of artists, designers, chefs, architects, musicians, photographers and filmmakers that call each city home, these books provide an insiders look at the hidden gems that make a trip memorable. Museums, notable architecture and sculpture, cultural icons, public events and moreevery necessity is covered, along with up-to-date recommendations on the hottest accommodations, eateries and shops, each imbued with a citys distinctive flair. A handy section on travel tips includes basic information on getting around. Detailed maps and QR codes provide ease of travel and a blank section at the back with lined, gridded and blank pages allows for note taking and sketching. Beautiful photographs throughout set the tone and provide a sense of the aesthetic appeal of each venue. In addition, the dust jacket for each volume unfolds to reveal an illustrated map of each city. Dont forget to pack this small but informative travel guide on your next excursion!